Jakob Ryley made the start and suffered the loss on the mound for the Falcons. 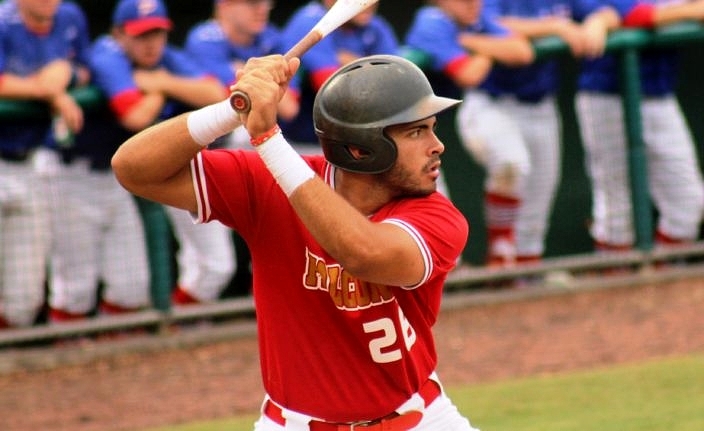 The Leto baseball team may not generally get much recognition. But one would be hard-pressed to find a better baseball team to be a part of. Wednesday evening the Falcons closed out their season the same way they played every game, with fundamental and passionate baseball. The last seventeen times out things ended in victory, but this time it was not so. 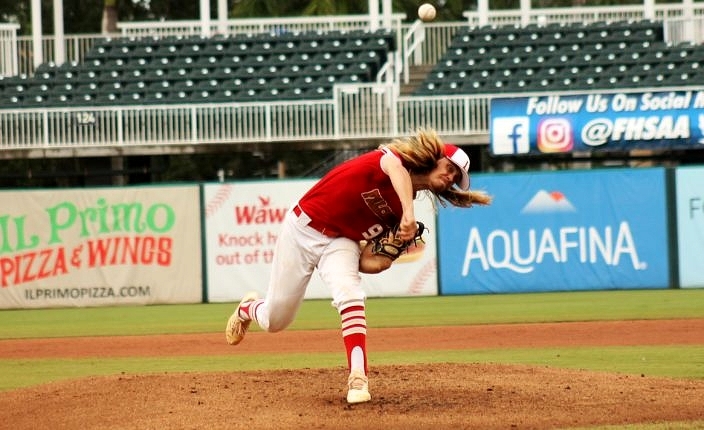 Instead it was the Pace Patriots under manager Jason McBride that enjoyed the better feeling of winning, earning a 5-3 victory over the Falcons, in a 7A state semifinal at Hammond Stadium in Fort Myers. The Patriots (24-6) will take on the Venice Indians on Thursday evening in the 7A title game, in a meeting between two storied programs with eight combined state championships. A pair of runs in the second got the scoring started for the Patriots to reward those fans that made the trip to Fort Myers. Aidan Gilroy walked and advanced to second thanks to a sacrifice bunt from Blake Cordova, and then moved to third following a passed ball. A liner into right field off the bat of Chase Bragg plated Pace’s first run, and Izzy Ham delivered the next when he followed with an RBI single to center field. An inning later, Pace was at it again. Bennett Shell sent a high fly ball to the right field warning track for a lead-off triple, and JC Preacher’s single through the right side of the defense drove Shell home and chased Leto starter Jakob Ryley from the game. Chase Bragg slides in ahead of the catch and tag from Jackson Alvord in the second. The fourth inning brought another run that increased the Patriots’ lead. Cordova reached on an infield single and advanced around the bases behind ground outs from Bragg and Caleb Vincent. Ham then rolled an RBI single up the middle for a 4-0 lead. The Falcons woke up the bats to battle back into the action in the top of the fifth. Jorge Carrero got it going with a base hit to center, before giving way to pinch-runner Damien Benton. Abel Diaz then scorched an RBI double deep to left field to get Leto on the scoreboard, before also coming in as RJ Gutierrez reached on an error. 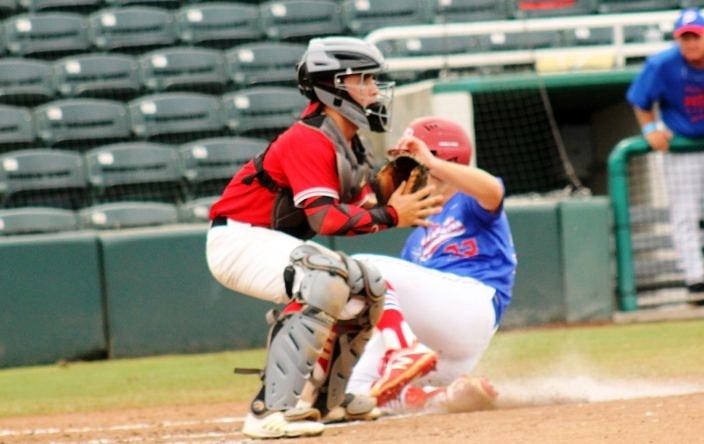 After Gutierrez stole second to get into scoring position, Fernando Muniz inched his guys closer with a single up the middle that sent Gutierrez around third and across the plate to make it a 4-3 ball game and chase starter Brandon Sproat. The Patriots elected to turn to the bullpen at that point, turning things over to side-armer Christian McCullough. The sophomore proved up to the task, holding the Falcons scoreless the rest of the way to secure the victory. McCullough allowed two hits and struck out two for the save, making things difficult late for the Falcons in adjusting to his side-arm delivery. After winning 17 straight games to this point, there was no letting up from any of the players. All year long Pizio has led the team through a larger, more important value. The players echoed that afterwards in sharing how they have come to believe that they play for something bigger than baseball in playing for God. Players have gotten used to their skipper occasionally talking to Jesus while in the dugout during games. Senior Jorge Carrero was 2-for-3 with a run for Leto. The accomplishments of the team this season meant even more to the larger picture of what the athletic programs are trying to do at the school. 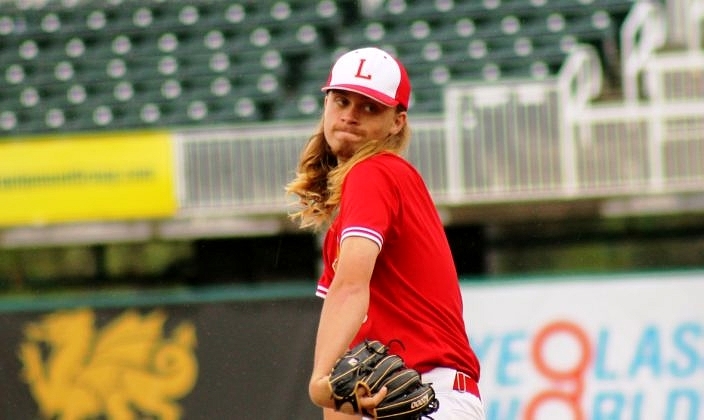 The track and wrestling teams managed to also send some players to the state tournament, and now the baseball team represented its school well at the Final Four. Pizzio reflected on all the great moments and memories the team has enjoyed together. The players shared a unique bond with their skipper, being able to joke and tease him like one of the guys. It is a united group that delivered a special 2018 season for a program that does not enjoy this much success every year. The Falcons may conclude a special season, but not much else will change just yet. Nearly all the players are sticking together to play for Pizzio this summer as well, helping to bring back American Legion baseball by playing at Post 248. The team has a tournament this weekend in which they hope to let out some frustration, and they will play about 40 games this summer.